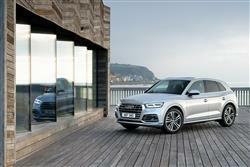 Find out everything you need to know on the new Audi Q5 from independent vehicle review website Car And Driving. You can watch the video review to the left to see more of the car or read their written review below to get a true insight from an expert in the automotive industry. If you've driven or even sat inside any of Audi's current models, you'll have a good idea of where this manufacturer is coming from. Even if you've observed one from afar, you may have an inkling. Audi products are largely variations on the key themes. The exteriors share much the same distinctive front end with its oversize grille and the interiors are studies in cool Teutonic efficiency. The engines and gearboxes are interchangeable in models from across the range, the clever control interface crops up time and time again and there are similarities in the driving experiences. Audi are by no means unique in this but with the benefit of this background knowledge, it's possible to form a fairly accurate picture of what Audi's Q5 mid-sized SUV will be like. Of course, the Q5 might have confounded any such expectations. Audi may have taken the decision to ditch all that build quality and understated sportiness stuff in favour of day-glow colour schemes, wooden fascias and engines that run on baked beans. They might of, but they didn't. The second generation Q5 SUV model I tried recently was much as expected, obviously an Audi and clearly pretty good. The Q5's styling remains fairly low key compared to some. It looks like you'd imagine an Audi compact 4x4 would without the tough off-road addenda with which some of its rival adorn themselves. It's more of a jacked-up hatchback, which is exactly what many buyers are looking for at the premium end of the mid-sized SUV market. This car might not be as bold or brash externally as we've come to expect in the SUV sector but inside, it aims to replicate the interior versatility of its most sizable rivals. Audi's cabin design and build quality remains tough to fault and the Q5 also includes some clever features that make the whole thing more practical to use on a daily basis. The rear seat backs can be reclined to increase comfort and the whole of the back bench can be folded into the floor at a stroke by means of a lever in the boot. Luggage space is 550-litres but once those seats are stowed, 1,550-litres is opened up. The driving experience is also very un-SUV-like. Audi has engineered the Q5 to excel on the road and largely, it does. Were it not for the higher driving position, you could almost be piloting an A3 or A4, such is the Q5's resistance to body roll and smooth ride. It's not the most exciting experience you'll have at the wheel of a mid-sized SUV but the Q5 smacks of utter competence and composure through a range of driving conditions. Engine-wise, most will choose one of the four cylinder variants - probably the efficient 190PS 2.0 TDI diesel I tried, which manages 56.5mpg on the combined cycle and 132g/km of CO2. It transmits torque to the tarmac via a standard 7-speed S tronic auto gearbox mated to an 'on-demand' 'quattro ultra' 4WD set-up, as does the alternative four cylinder model, a 252PS 2.0 TFSI petrol variant. The prodigious power of the V6 derivatives requires a different approach. For these, Audi has stuck with the previous permanent quattro system and paired it with a beefier 8-speed tiptronic auto gearbox. Here, there are two 3.0-litre options, a 286PS 3.0 TDI diesel or a 354PS 3.0 TFSI petrol unit, the latter powerplant reserved for the potent flagship SQ5 model. The Q5 kicks off at around the £37,000 mark and is offered with a decent haul of standard equipment and a bulging options list giving buyers the opportunity to inflate that asking price at will. The one box I think you really have to tick is that for the 'Rear bench seat plus' package, which enables you to slide or recline the rear bench and fold it in a 40:20:40 split. The second issue I'd turn my attention to is that of getting the suspension set-up right. I actually think the standard 'Comfort Dynamic' package is very good, certainly much better than the stiffer 'S' Sport suspension' that's optional in 'S line' trim. If you do want to change things in this regard though, I'd suggest you go for the adaptive damping package - Audi calls it 'Adaptive Comfort suspension with damping control'. With this fitted, you get suspension that can be controlled to suit the way you want to drive via the various modes of the 'drive select' vehicle dynamics system. Another extra cost suspension set-up that varies with the chosen 'drive select' mode is the 'Adaptive air suspension' set-up which not only improves the ride on-tarmac but also gives your Q5 extra capability 'off piste', adding in an extra 'allroad' mode to the Audi 'drive select' system. Audi's Q5 may be predictable but it's still predictably very good. The designers have done enough in the interior to give the car real extra practicality but the driving experience is very car-like and quality levels are right up there. Unless you go for the top SQ5 model, it's not the most exciting choice you could make in this segment but it's a very impressive one. That'll be enough for most.